Today, we’re thinking all about christening cakes. They really add to a christening, whether it’s a serious affair or a fun family event, and the focus should be on the new baby. That’s why we love creating cakes around the theme of Noah’s Ark, which bring together perfectly the religious element of the day with the child-friendly, vividly coloured sugar animal models. It’s a fantastic way to get the entire family involved, and it’s a real talking point that will appeal to not just baby, but all the guests too. These cakes are also ideal for other religious events, such as baptisms and naming ceremonies, and will make your event truly special. Not only this, but our talented cake artists are able to create Noah’s Ark cakes in all sorts of flavours, from classic vanilla sponge to rich chocolate fudge or a light, flavoursome carrot cake. Why not go for an interesting blend of flavours with one of our popular marble cakes? 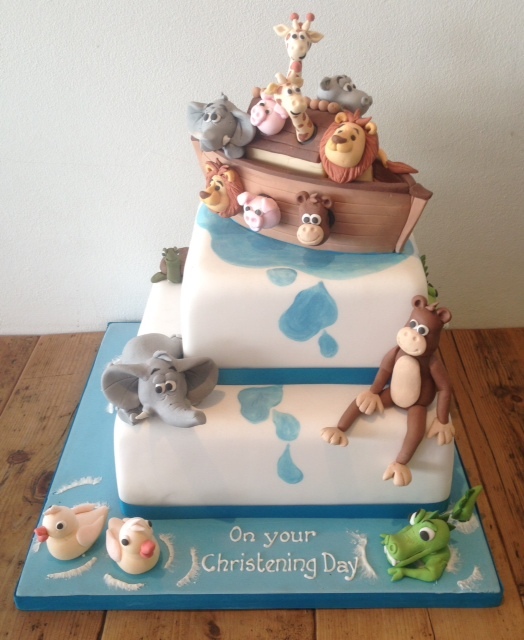 A 3D Noah’s Ark christening cake to serve 25-30 people will cost £275, and is the perfect addition to any christening celebration. Just make sure people aren’t taking slices two by two or you may find it sails away quicker than you anticipated!